THE NEXT TIME you are on the Internet, type “Charlemagne” into a search engine and look at the pictures that come up. You will see paintings of Charlemagne looking regal, with an ornate crown on his head. Or you may see warrior Charlemagne, wielding a massive sword. The most dramatic pictures are of Pope Leo III “unexpectedly” placing the emperor’s diadem on the head of a majestic (but humble) Charlemagne. In the world we know, the value of education is seldom debated. Nearly 85 percent of Americans over 25 have graduated from high school, and a quarter have college degrees. But a century ago the numbers were reversed; less than one out of ten people graduated from high school. It should be no surprise, then, that in the early Middle Ages, education was even less widespread. While it is debatable whether there ever truly were “Dark Ages,” it is certainly true that the classical education available to the upper classes of late antiquity was no longer as prevalent in early medieval Europe. To be sure, certain people—typically males—received a rudimentary education. In the seventh and eighth centuries, the sons of European kings and nobles were often given training. But it was usually not in the rhetoric, philosophy, and grammar that Tertullian or Augustine would have known—rather, it was in the skills needed for warfare. Swordplay and military tactics were far more helpful in securing a young lord’s future than conjugating Greek verbs and quoting Cicero. All of this changed when the Frankish king known at first only as Charles or Karl ascended the throne of the Franks in 768 upon the death of his father Pepin the Short. 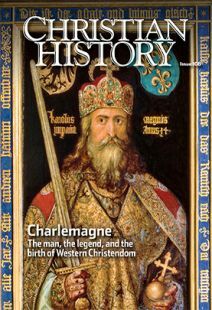 Beyond the changes in the political landscape of Europe that he achieved through conquest and intrigue, Charlemagne also ushered in a cultural revolution. At its core was a series of educational reforms that would influence continental Europe and Christendom for centuries. It may be an overstatement to say that Charlemagne was illiterate, but even his doting biographer Einhard (775–840) admitted that the king had only limited ability to read and write. Charlemagne often kept writing tablets close at hand so that he could practice tracing letters, but, said Einhard, he never made much progress, because he began too late in life. Histories and treatises had to be read to him, presumably because he could not read them himself. But while the king could not read or write well, he greatly valued intellectual activities. He routinely had the Psalter and writings of the early church fathers read to him at mealtimes—apparently he felt a special fondness for Augustine’s City of God. But he also listened to secular stories and classical literature, both of which would be important in the Carolingian Renaissance to come. According to Einhard, Charlemagne became proficient in many of the liberal arts—rhetoric, grammar, mathematics, and astronomy in particular. Moreover, he valued the study of languages he did not know, especially Latin and Greek. The image Einhard sought to portray was one of a thoroughly educated monarch, in the tradition of Roman emperors. We can’t assume that the picture of Charlemagne painted by the adoring Einhard is entirely accurate. But even if the king was not quite as skilled as his biographer indicated, that does not mean that the biography has no value. To the contrary, the fact that Einhard took such great pains to portray Charlemagne as an intellectual shows how important education had become in the opening days of the ninth century, or at least how important it was for a ruler to be known as an intellectual, especially for political reasons. A Frankish king from northern Europe who seemingly wore the mantle of centuries of classical education—this went a long way toward establishing his legitimacy as the head of the Holy Roman Empire. There is little doubt that Charlemagne had a great love of learning, but he also insisted that the value he placed upon education should spread to his family, his court, and beyond. He began with his own children. To achieve this worthy goal, Charlemagne called upon his old friend Alcuin (740–804). Born on the eastern coast of Northumbria (now northern England and southeastern Scotland), Alcuin (see p. 28) showed much promise as a student in the cathedral school of York. When Ælbert (the school’s headmaster and librarian) was made bishop of York in 767, Alcuin became the new head of the school. As bishop, Ælbert was expected to travel periodically to the European continent to oversee the missionaries he had sent to northern Europe and to consult with secular rulers. When he did so, he sometimes took his protégé Alcuin. On one such journey, in 781, Alcuin met the ambitious young Frankish king, who asked the Northumbrian to be his tutor in rhetoric and astronomy. When Alcuin was invited to join Charlemagne’s court, he did so reluctantly. Once there, though, he proved influential and eventually adopted the land of the Franks as his home. Charlemagne’s biographer Einhard believed Alcuin to be the most learned person in the world, a worthy companion to a young ruler who was already the most powerful man in western Europe. Indeed, the Northumbrian schoolmaster was a remarkable scholar. Beyond his skills in the liberal arts, Alcuin wrote Bible commentaries, theological works, and biographies of Christian saints. When Charlemagne decided that his kingdom needed an official version of the Bible, he called on Alcuin to supervise its production. Who better than Alcuin, then, to be the head of a palace school, where the sons and daughters of Charlemagne and other nobles would be taught not only the skills needed for being leaders, but also the liberal arts? Lessons were laid out, court libraries were established, and the model for training young nobles that would continue for decades, if not centuries, was begun. The educational reforms of the Carolingian Renaissance were under way. Although one could argue that the intellectual explosion of the Carolingian Renaissance began with the education of the king himself and his family, it did not end there. In 787 Charlemagne issued an edict that bishops and abbots (the heads of monasteries) should begin educating young boys in reading and writing, the Bible, theology, and grammar. The purpose was primarily to educate these lads for service to the monastery. In the same way that the monasteries of Ireland had been islands of scholarly activity that kept classical knowledge alive when continental Europe was in decline, Charlemagne wanted Frankish monasteries to be centers of education, where Christian doctrine could be taught uniformly and preserved correctly for posterity. Ten years after this first edict, Charlemagne expanded his vision for an educated kingdom by ordering priests and monks to provide for the education of children in their districts, and not just those who were headed for the priesthood or monastic life. So monasteries and churches began basic educational programs in the regions where they were located, providing a level of learning to boys (and sometimes girls) at no charge. While these village schools certainly cannot be compared to widespread public education such as we know today, it was a step in that direction. Education was slowly becoming available to a wider audience than just the elite. It was no easy task to turn monasteries into intellectual hubs. Libraries needed to be created with books collected from around the western world, the curriculum had to be set, and teachers needed to be employed. While Alcuin was the driving force in Charlemagne’s early educational reforms, he was not sufficient to the task of educating an empire. So early on, other teachers were called in to continue the reforms. Foremost among these were Irish monks. Monastic communities such as Glendalough, Clonmacnoise, and Kildare had long been the intellectual and spiritual centers of Ireland, their abbots and abbesses rivaling (or exceeding) Irish bishops in power and learning. Many Irish monks were known for their intellects. They would listen to readings from the fathers of the church at their mealtimes and then retire to cells to make copies not just of Christian texts, but also of Irish law and pagan Celtic legends. They created beautiful illustrated Gospels such as the Book of Kells. They developed a revolutionary new devotional practice of private confession and penance, based on the teachings of John Cassian, which would one day have an impact on all of Europe. And perhaps most important, they were involved in missionary work to Caledonia (Scotland), Britannia (England), and the European continent. These Irish monks and theologians were precisely the ones Charlemagne needed to carry on the educational reforms begun under Alcuin. Most notable among them were Clement of Ireland, a successor of Alcuin at the palace school; Joseph Scottus, who served as a poet in Charlemagne’s court; and scientist-monk Dungal of Bobbio, who taught the king astronomy. Perhaps the most famous of these Irish transplants was the Neoplatonist philosopher Johannes Scotus Eriugena (see p. 29), who served as a grammar instructor in the court of Charlemagne’s grandson later in the ninth century. He was a remarkable scholar, though a controversial one, whose writings on predestination and on creation would one day be condemned by the Catholic Church. While the Carolingian Renaissance showed diverse and multifaceted intellectual creativity, it had unifying themes in its educational reforms—threads running through nearly every innovation. First, the value of the written word. It is hard for us to imagine how valuable books were in the early Middle Ages. For one thing, without mass production of books available, they could be rare and extremely expensive. Owning a set of books showed that you were part of an elite class. It was not very important whether you could read them or not; they were status symbols even if sitting on a shelf unread. In Charlemagne’s court, though, the written word took on an importance much greater than merely a commodity for filling nice bookshelves. It became the medium by which the institutions of Carolingian society could be standardized and maintained. Ways of living the religious life, secular laws, morality—all were committed to the written word not only for posterity, but for management of daily life. Second, the spread of literacy. We have long known that literacy was not uncommon among medieval clergy and monks. Indeed, that very literacy helped make these groups among the elite of society. They had the mystifying ability to make sense out of scratchings and dots on a page, marks whose meanings were lost on the average person. In the Carolingian period, though, literacy moved out of the monasteries and sanctuaries and into the towns. Lay literacy, though rare compared to modern standards, became relatively widespread among the nobility, and to a lesser degree, even among commoners and women, two groups that had sometimes been kept uneducated in the early Middle Ages. Third, standardized learning. Charlemagne made sure that education in his kingdom had a high degree of uniformity. His palace schools followed a relatively uniform curriculum, which was taught using a standardized form of Latin. Priests and monks teaching in villages did not have as comprehensive a curriculum to follow, but they were ordered to give their students accepted lessons in Christian theology and morality. Even writing became standardized through the widespread adoption of the Carolingian minuscule, a type of calligraphy that could be read across the empire (see “Did you know?,” inside front cover). Carolingian minuscule was used to produce religious texts that could be read in personal devotion or in public worship. But just as important, it was also used in copies of the classical texts that were resurfacing on the European continent. Finally, a merging of the religious and the secular. The Carolingian period was a fertile time for religious scholarship. People copied and widely studied the writings of the early church fathers. Authors penned commentaries on the Bible, some of which would influence Christian thought well into the High Middle Ages. Other thinkers took copies of biblical and other religious texts and inserted thoughtful comments called glosses into the margins or between the lines of text, words that could became as influential as the original manuscripts. But like their Irish teachers before them, the scholars of Charlemagne’s court also studied secular, even pagan, texts. They did not hesitate to examine the works of Greek and Roman philosophers or the legends of Germanic heroes—and then to teach them alongside lessons from the Bible and Christian theology. In this, they laid the groundwork for heady, controversial intellectual movements that would dominate Europe in the following millennium. How long did the Carolingian Renaissance, with its signature educational reforms, actually last? Some scholars say that it stretched from Charlemagne‘s crowning in 768 well into the tenth century. In truth, though, much of the advancement under Charlemagne stalled a generation later when his empire was divided among his grandsons. But for a brief, shining moment in medieval Europe, a semiliterate king of the Franks inaugurated a period of intellectual fervor. Its influence would be felt 400 years later in the thinking of Scholasticism, 700 years later among the intellectuals of the Renaissance, and even in the musings of Christian intellectuals in the twenty-first century. Garry J. Crites is director of the Osher Lifelong Learning Institute at Duke University.